Dr. Payal Trivedi graduated from the University of Illinois College of Dentistry in 2002. She worked in private practice for 10 years before she purchased Inverness Dental Care in 2011. Her fine communication skills, coupled with her technically superior dentistry, have allowed her to very quickly adapt to this change. She is excited about this new venture and to provide quality, caring dental care to the northwest communities. Her skilled hands and a gentle, calming demeanor have become her trademarks as a dentist. She is also a member of the Northern Fox Valley Chapter of Women in Management organization. In 2009, she won the Women of Achievement award in the Licensed Professional Category. She gives presentations to children during Children's Dental Health month and has spoken at several daycare centers to inform children, and their parents, of proper dental care. Dr. Trivedi strongly believes that education, especially at an early age, is the best form of prevention. She has participated in the Dentist With A Heart program, where one day in February is donated to those who are in need of dental work and cannot afford to take care of his or her dental needs. She also devotes her time and skills to help the underprivileged with their dental needs. Dr. Trivedi keeps abreast of the latest developments in her field through continuing education courses. She lives in Barrington with her husband, three beautiful daughters, and in-laws. She is joined by her wonderful, trained staff members: Vivian Prokos, our licensed hygienist, Donna Wilewski, our office manager, and Diane Jacobsen and Sarah Schecterle, our certified dental assistants. 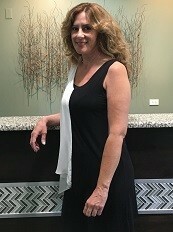 Vivian Prokos is Registered Dental Hygienist and has been practicing for over 25 years. She graduated from Loyola University earning a Bachelor of Science in Dental Hygiene. She believes that preventive care and education are keys to optimal dental health. Her goal is to provide a wonderful dental experience to patients with the highest quality care. She loves to provide quality personalized dental care to each and every patient. In her spare time she loves spending time with her 3 children as well as traveling.